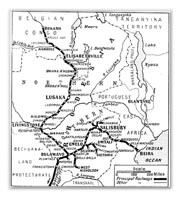 It was a bitterly cold morning when I stepped off the train at Bulawayo station in June, 1913. I had heard a lot about the heat in the Rhodesias, but never a word about the cold. It had been a long dusty journey through Bechuanaland. On the straight bits of the sandy railroad track the train flew, or so it seemed, stirring up fine dust which sifted in through closed doors and windows, covering everything. In later years these sandy stretches were ballasted and thereby the dust nuisance, although not eliminated, was greatly reduced. The train was not due to leave for the North for several hours and it was customary for passengers to spend the time sight-seeing, buying curios and patronising hotels and tea-rooms; and for those who wished to go further afield, a visit to the Matopos where lie the remains of Cecil John Rhodes, and also the monument to the heroes of the Matabele wars was very popular. Once more settled in my compartment, I prepared to watch the countryside go by. The many little sidings were much alike. At some the train stopped only to take water, at others there was the usual sale of curios and skins. The skins reminded me of the times when I was a small child visiting on farms where hospitality was boundless, but accommodation often became too strained for each guest to have a bed; we children had to sleep on the floor covered with a kaross. How I hated the smell. The countryside was very flat and uninteresting and, as far as I could see, uncultivated. With the windows open I fell asleep. When I woke up my face was stiff with dust and felt like a drawing board. Not knowing the value of a mud-pack, I proceeded to remove this one. I remembered my pot of Oatine, my one and only cure for all my ills, from a grazed knee to sunburn. I covered my face with it, then wiped it off with a towel; how I longed for a bath. The next morning we arrived at the Victoria Falls station where most of the passengers left the train to spend the next few days exploring the Falls and the surrounding beauty spots. We were soon on our way. The trees were too tall and dense for us to see the Rain Forest which we were passing. Then we were in the cutting approaching the single span bridge across the River Zambezi which connects Northern and Southern Rhodesia. The train slowed down to a snail's pace and I watched breathlessly for my first glimpse of the great wonder, the Victoria Falls. I did not then realise that I would be privileged to know it in all its moods, in all its seasons, in all its treacheries. We entered the bridge and I saw the spray cloud which is called 'The Smoke that Thunders', rising out of the depths, and there was the Main Falls seen through two mighty cliffs, one on the North bank and one on the South bank, standing like two giant sentinels eternally guarding the most beautiful and precious gift of nature to the two countries they divide. These cliffs, hundreds of feet in height, form a narrow gorge through which the water of this great river, the Zambezi, must flow. The water then runs into the 'Boiling Pot', so-called because of the way the water swirls round and round, spilling itself higher and higher over the rocks, finally passing under the bridge to the 'Silent Pool' protected by huge cliffs, and so on its way to the sea. We were now across the bridge and in Northern Rhodesia. My excitement rose as we were approaching Livingstone, the capital of Northern Rhodesia. The train steamed slowly on; the country was flat, the trees were bare and the grass, although tall, was brown. In spite of this it had a fascination for me; I clothed the scene with all the romance and adventure I had read about in preparation for my holiday. We rolled into Livingstone station. The station buildings were of wood and iron. I had become accustomed to this, for even the Victoria Falls Hotel was a wood and iron structure. It all added to the pioneering spirit I was adopting. There was no platform. I was to find that there were none at any station in the country. Fortunately, everyone was young and could take the leap to the ground. I jumped down. The train was not due to leave for some hours. I started to walk towards the village; the road led through an avenue of seringa trees, now void of leaves. It seemed to run through bare veldt leading to nowhere, so I retraced my steps on the sandy road, but felt refreshed by the exercise. At the station I found the usual display of curios with the addition of some attractive and useful grass mats, trays, fans and even hats. I noticed the native women wore long full skirts and some of the men wore full knee-length skirts - a style no doubt influenced by the Victorian dress worn by the wives of the early missionaries who settled in Barotseland. It not only became the national dress of the people, but also raised the status of the wearer who wore the fullest skirt; old skirts became petticoats while the new ones took pride of place. I got back on to the train curious to find out what sort of country lay ahead. My journey was due to end at Lusaka where my two brothers awaited my arrival. The country became a bit more interesting as we left the sandy Zambezi valley. We arrived at Kalomo, once the capital of Barotseland, North Western Rhodesia. There were no signs of any grandeur, if there had ever been any. We rose to higher ground until we came to Choma; this might be called the Highlands. The district was already recognised as a fertile farming area. It had its quota of traders and a post office, a trader acting as postal agent. We lost altitude after this as we passed through several little stations. From Mazabuke we dropped into the Kafue valley. The journey was slow with many seemingly unnecessary stops. There never seemed to be much cargo to discharge. Perhaps the heat and mode of locomotion were responsible and a cooling period had to be observed. Every station had some Europeans meeting the train; whether they came for mail, a parcel or just to see a train, I did not know, the reasons were all important. Approaching the Kafue bridge we passed a great swampy stretch where a lone water lily still clung to the summer which dies hard in the Kafue valley. The river is very wide and has no banks, running level with the surrounding land, spreading itself into large swamps. A long one-track bridge spanned the river. Kafue consisted of a few wood and iron buildings on piles, and looked the desolate, unhealthy place it then was. I was told that only a few years earlier the population of the graveyard was eleven, and the living only five. Blackwater fever was rife. The station was later moved to higher ground. In the rainy season the river spread itself further afield. The passage between the train and the station consisted of a bridge of poles planted into the ground with a covering of slats across. The country round Kafue was hilly and attractive, but this did not last long before we were on a plateau; a few more stops and we would be in Lusaka. As the train moved into Lusaka station I saw my two brothers with a few of their friends who were filled with curiosity about the 'little sister' - being the youngest of the family, it described me. The train slowed down to a stop, I jumped into my brothers arms. I had arrived. We set out for my brothers' living quarters; it was difficult to know what to call it, it was not a house, it did not rise to a residence. I learnt in the next few years to call it 'home'. We passed through an open gateway in a wire fence, the boundary between the station property and Cairo Road - part of the much talked of Cape to Cairo road which would bring friendship and prosperity between nations. 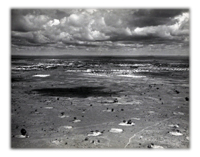 It was just a sandy track, bristling with outcrops of limestone with which Lusaka and countryside abound. It was hardly fit for ox wagon travel. We turned South in Cairo Road. About one hundred yards on we came to a wood and iron building built on piles - a precaution against white ants. This was a hardware store. Behind this were two kator huts, like two painted galvanised iron tanks, about six feet apart, brick-lined walls, floors of brick covered with coir matting; a door and two windows to each. The windows had glass panes and opened outwards. The living room had a table, chairs and an old fashioned leather sofa; a sideboard lavishly decorated with glass and silver, including a fine silver tray, all of which my brothers had brought up from South Africa. The other hut was the bedroom. It was divided into two by a Heath Robinson-type partition consisting of two gaudy blankets sewn together and hung suspended from an iron rod resting on the walls of the hut, with a similar rod holding them down on the floor, thus making room for me in just less than half of the space, and my brothers on the other side. Both huts were covered with rubberoid roofing, making a cool passage between, and protecting doors and windows from some of the sun and rain in the summer. At right angles to the living room there was a brick kitchen and store room where Bengery held sway. Bengery had been with my brothers for some years, nursing them through bouts of malaria whilst they were battling against the bush in a farming venture which, for want of capital and experience, was abandoned in favour of a greatly needed hardware and blacksmith shop, in a country where only ox wagon and bicycle transport were possible. 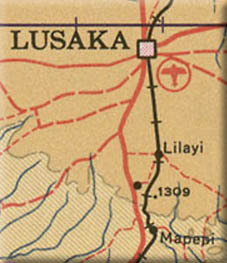 Lusaka consisted of two streets with a sanitary lane separating them and two cross roads leading to the farms East and West of the town. The township was divided into plots called 'stands'. Ours was the first occupied 'stand' facing the station on the southern entrance of Cairo Road. On the next 'stand' stood Mr. Glasser's general dealers shop, behind this was a pole and dagga house where he lived with his wife and three children. It was amazing how comfortable and even attractive these houses could be; it was the most commonly used type of house in the country. I will try to describe such a house. It was built of poles closely planted into the ground, plastered inside and outside with mud; any number of rooms under a thatched roof, with the eaves coming well down to protect the walls from rain. The windows were wooden frames covered with calico lime-washed on both sides; these were fitted into other frames in the walls. They tilted, the perpendicular, closed, the horizontal, open, fastened with many types of home made gadgets. The houses were ceiled or not, depending on how well they were thatched or whether borers were present or not; ceilings might be calico or reeds closely lashed together. The floors were covered with native-made mats, edge to edge, with cured skins or floor rugs placed about. Curtains would be of some gay print furnished cottage-style. Furniture varied from nativemade grass and or wooden hand-made pieces to odd items brought from home or some other country. Further along Cairo Road across the farm road going West, was Marston's Hotel. On the corner was the main building of brick, a bar where the regulars were never late, and the dining room. In the background were a number of mud huts for staff and guests. The hotel was the centre of all activities in Lusaka, where town and country met, either to eat, drink, dance or just to gossip. Farmers meetings and church services were held there; a visiting parson came up from Bulawayo once a month. I remember the time when we were all rounded up at a moment's notice to attend a dance to be held that night. Good music was promised. The pianist was none other than Mrs. Botha, the wife of General Louis Botha, a famous South African General and the first Prime Minister of the Union of South Africa. Mrs. Botha had come up to spend a holiday with her sister whose husband and son farmed in the Eastern district. The only form of transport being by ox wagon, they had to spend the night in town for fear of the oxen being taken by lions. Mrs. Botha's contribution on the piano that night was to us as good as a full orchestra at any Assembly ball. The next important place of meeting was the Post Office, a mud hut situated in the lower corner of the Hotel 'stand'. It had a counter separating the public from the Post Master; pigeon holes for Poste Restante and all the other postal mysteries. The post bags were brought up from the train by a red-uniformed messenger and sorted by the Post Master. The twice-weekly mail train meant a twice-weekly gathering for town and country folk; there may be a friend or an acquaintance on the train. The next move was tea somewhere en route, to give the Post Master a chance to sort the mail, then on to the post office. Standing outside the open window it was easy for the Post Master to call out the names and flick out the letters to the addressees. There was no house-to-house postal delivery; streets had no names or numbers, but you could send a telegram and there would be no difficulty about delivery. On the next 'stand', separated by the sanitary lane, was the Government School, and living quarters of the first Government School teacher in Lusaka, Mrs. Luce Vere-Hodgson, who became and remained my very dear friend for many years. On the next 'stand' was a brick building where the Magistrate held court. Opposite was Blacker's Store; this was the last building on the road going to farms on the West of Lusaka. Back into Cairo Road, a 'stand' or two from Marston's Hotel, was Morton's Butchery, then Mr. Saul Jacob's wood and sacking shack. Across the road there was Kollenberg's General Dealers store and de Grandhom's butchery. That was the North end of Cairo Road and Lusaka. Other houses were spread in the back ground, where the inhabitants lived. Mr. Kollenberg built the first what could be called modern house in Lusaka of brick with all the refinements of the future, such as, proper sash windows, cement floors, iron roof. We watched it go up brick by brick. The envy of every housewife. 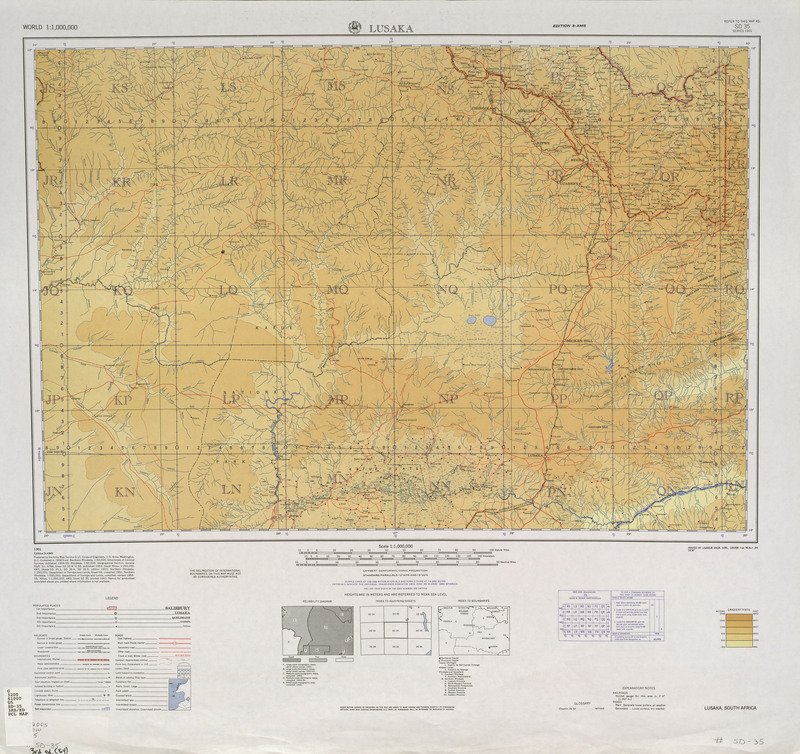 We left Kasama in February 1918 in pouring rain. The first leg of our journey was done by military convoy as far as the Chambesi (Chambehshi) River. We reached the river late that afternoon only to see the pontoon boys making for home. Our driver hooted, but they took no notice until Mr. Simpson arrived on the other side of the river and fired a shot across their bows, whereupon they rowed back and we were ferried across. We spent the night with Mr Simpson. I was very wet, my oilskin mac had perished at the seams; I had stitched it up by machine, leaving the rain to soak through the holes made by the needle, but it had to do service until I reached civilization again, Chemweka was a well trained cook and I can still remember the bream which he gave us for breakfast. fresh from the river into the frying-pan - food surely fit for the gods. We set off once more: this time in a dugout which was just wide enough forme to sit with our baby Billy's basket beside me. with Tom and a suitcase behind us. A flotilla of canoes followed carrying our personal belongings plus food for everybody. Cook was in charge of the food boxes. The paddlers stood up fore and aft in the canoes, bending and straightening as they sang their river songs to the stroke of the oars. They were a happy bunch. There was lots of laughter and. if my interpretation was correct, we were not entirely left out of their jokes. They were completely at home in their canoes, standing paddling for hours on end. without any signs of awareness of the ever present dangers of the river. The river folk had well developed arms and shoulders, whilst their legs were less developed. The river here was lined with trees in their summer foliage making a soothing background at eye level. The head man was the paddler in the front of the first boat. He was alert to anv unusual movement in the water or on the banks. When game was spotted there would be complete silence. Tom and a gun bearer would land and. with any luck, a kill might be made and there would be great rejoicing. The news spread from canoe to canoe. We were heading for Sumbu. 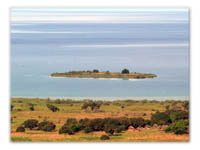 an island in the Chambesi where Mr, Goodall. the District Officer, was stationed. He was not at home, but we were invited to stay in his home to await the arrival of the Government barge in which we were to continue our journey. It was a lovely day and we were lulled by the peace of nature, broken only by the call of a bird or a fish out hunting in the reeds. Occasionally a school of hippos was spotted; the boat would take a sharp curve to the opposite bank. As long as they are not separated from their calves hippos are quite safe. They are very short-sighted and inquisitive: this can make them dangerous. Sometimes their curiosity tempts them to investigate when there is an unusual noise; this might be just a game to the hippos, but was verv dangerous for small craft. Their huge bulk could swell the water to dangerous heights; they might even decide to take a closer look, dive under the boat and send everything and everybody to the bottom. It was very late when we arrived at Sumba. We heard sounds of revelry, drums beating and the thumping of many feet, but there was no one to meet us. Our head man halloed, but nothing happened until Tom fired a shot into the air. There was immediate silence. In minutes we were welcomed bv the sergeant in charge of the now subdued crowd. Great interest was shown when the baby's basket was lifted out. When we reached the hut. the official residence of the administering officer of one of the most primitive tribes in the country, we found that 'Time' (our cook) and the food boxes had not arrived. We were hungry and cramped as well as tired. We had a tin of Masonachie rations and some biscuits with us; we 'borrowed' some tea from the house and had a feast. When we finally fell into bed it was to sleep the sleep of the just. A real bed was good. The next morning there was a crowd of women and children to view the 'contents' of the basket. I wish I could have understood what they said. 'Time' looked very proud. We were glad to have the chance of catching up with the washing. 'Time' also had the opportunity of doing some baking, and cooking what he could for the next few days. Camping in the rain was difficult, but 'Time' was a 'fundi' (expert) at cooking in a covered baking pot in a scooped-out hollow in the ground with plenty of coals beneath it and more on the lid. We did not enquire too deeply into methods for the result was always palatable to hungry mouths; Billy's food was always the right temperature and quantity and always on time. The next day or two passed pleasantly, then we had a short day as we were about to enter the swamps where wood was scarce and so wood had to be collected and carried. The next night we camped right in the middle of Kansenga's village as it was the only dry spot for miles. In summer these people had to move to higher ground as the floods rose and food became very scarce. This was their last stand. When the water subsided they returned to build anew their bee-hive shaped grass huts and eke out a living on what they could grow. They lived on fish, game and certain natural foods like caterpillars, white ants, wild spinach, roots and berries. When we arrived they were eating happily and I was told they were eating crocodile steak. We were glad when the sun set as the flies were driving us mad and we fought a losing battle with fly swats. Then the mosquitos came. We got under our nets as soon as we could. As an added precaution. I put Billy's basket at the foot of my bed under my net. We noticed the absence of young women or girls in these parts. The reason I was told after was that they were hidden when anyone strange arrived for fear of having them taken away by their enemies. We made an early start the next morning, glad to leave these primitive surroundings. The people seemed happy enough, but to us their way of living was very depressing. The river banks were lined with reeds and rushes backed by tall grass, like a green frame to the edge of a mirror, reflecting the changing cloud formation in the blue sky above. When the men stopped singing, the swish of the paddles as they broke the water was very soothing. We landed for a normal break and Tom decided he would scout around a bit as there might be a reed-buck nearby. He was not away many mintues when he was back again. He said that with every step he took a huge cloud of mosquitos rose up from the ground to attack him. When the old women came to look at us on these occasions, they would hide behind the trees, approaching furtively from tree to tree until they were within seeing distance of the cot. Any movement by me would send them fleeing, making fearful noises by screaming and slapping their hands to their mouths, thus breaking their screams into weird sounds, to stand gazing again at a safe distance. Possibly Billy was the first white baby they had seen. To reach Lake Banguela we had to push our way through tall reeds along winding narrow waterways made by dugouts. This time the mosquitos invaded our barge and once more we fought a losing battle with switches until we were in clear water again. We crossed the lake and entered the Luapula River, when camping became once more a pleasure. The edge of our anxieties about Billy's welfare had worn off and we continued our journey to Chawutuwutu. We were taken to the guest house which, we were told, a lion had visited the night before, and there were claw marks to prove it. It was good to be on terra firma and stretch our legs again. It was hot; there was no cooling breeze from the river and this made us feel how lucky we were to have chosen the water route. We did not waste time on the road bartering for food for we were makine for N'Dola. back to civilization.